This weekend I had taken a couple of days holiday that I had to use up or I would lose them. I had planned on using the time to get the garden tidied up but the rain and snow put paid to that idea. Nicola had also taken the time off as she wanted to spend time with her fantastic husband, although that may have been a cover story as she had also made plans to carry out an errand on behalf of LittleGems Jewellery. After dropping off a donation with Face Of Glasgow, Siobhan Scott, for the Girlz Glitz & Glamour charity day in aid of The Beatson Oncology Unit in Glasgow, we had a wander around the shops before heading for some lunch. We had booked lunch at One Ten Bar & Grill using Scotland's leading online restaurant booking site 5pm.co.uk which is a great site to use to book lunch or dinner, usually with a free glass of wine thrown in for good measure. One Ten Bar & Grill is the bar/restaurant connected to the four star boutique Marks Hotel on Bath Street. We arrived just before one o'clock and were glad to get out of the icy cold weather and into the warm bar where we were quickly seated by our efficient waitress. 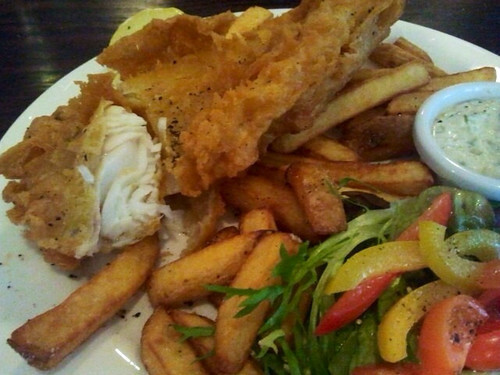 The 5pm deal was either fish'n'chips or burger and chips with a glass of wine or half pint of lager for £7.95. I've previously written about the fact that Nicola is a bit of a fish'n'chips connoisseur so she was looking forward to trying out the half portion of haddock and chips that was on the menu. With the recent press coverage about horse meat still fresh in my mind, I asked if the burgers were homemade by the chef but was told that whilst the restaurant do have homemade burgers on the main restaurant menu, the burgers on the bar menu are bought in from a supplier. This made my lunch decision easy as I joined Nicola by ordering fish'n'chips too. As we sat waiting on lunch being served we noticed that with the exception of ourselves and a group of young foreign tourists, the rest of the diners were in their fifties or older. This might be down to the fact that the menu is very reasonably priced with a wide range of sandwiches, salads and classic lunch dishes, or it could be that One Ten Bar & Grill is just 100 yards from the pensioners shopping paradise that is Watt Brothers. 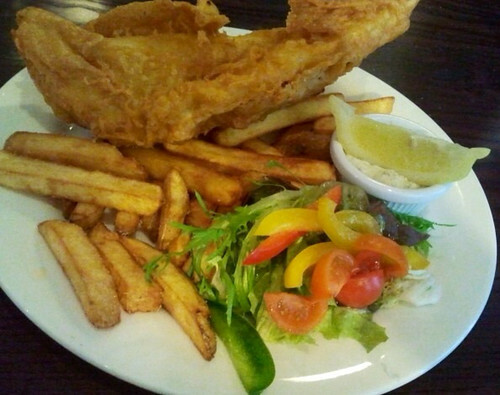 Don't let that put you off, if everything that comes out of the kitchen is as good as the fish'n'chips that arrived at our table, then we'll be back soon. 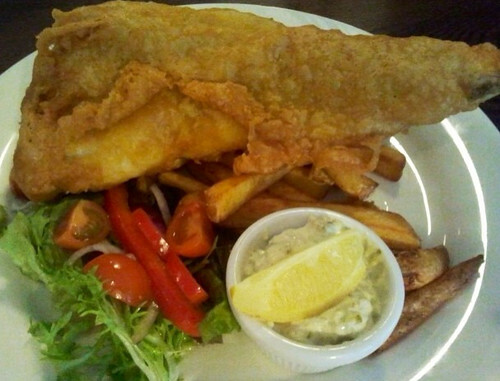 Our lunch was described on the menu as 'Half Portion of Haddock & Chips', and as I sat staring at the huge piece of beer battered fish on the plate, the words of Captain Ahab came to mind - "From hell's heart I stab at thee; for hate's sake I spit my last breath at thee. Ye damned whale." Seriously though, the haddock was huge, almost 12" in length and deliciously flaky inside a wonderfully crisp beer batter coating. The fish was accompanied by a cluster of hand cut chips, and a dressed side salad, with the obligatory lemon and tartare sauce. We both tried our best to to work our way from head to tail but neither of us could finish everything on our plate. The menu price for the fish'n'chips was £7.95 and we felt that the portion size was fantastic for the price. I would have been happy to pay full price for lunch, the fact that our 5pm booking had a glass of wine included made this an even better deal. My in-house fish'n'chips expert was hugely impressed giving a score of 9/10, commenting that the overbearing size of the fish was what causes her to deduct a point. Apparently size isn't everything! Otherwise, we had a great lunch at One Ten Bar & Grill and will definitely be back in the future. Remember to check on 5pm.co.uk for any available deals, don't worry if you can't find any offers as you'll still get great value from the well priced lunch menu. 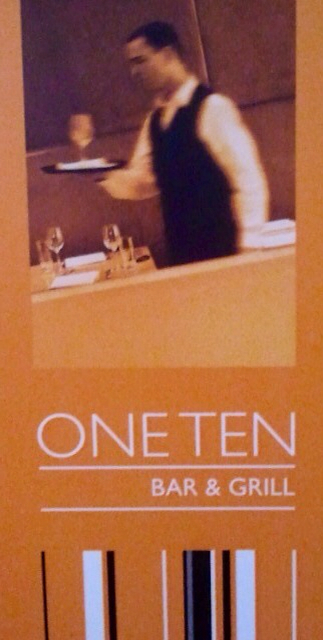 Keep up to date with One Ten Bar & Grill and Marks Hotel on Facebook and Twitter.